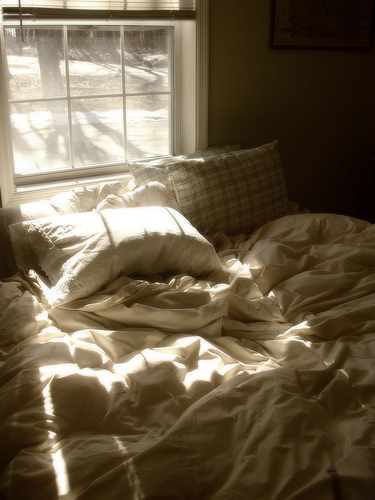 Stray sunbeams made their way through her window, dancing gently on her eyelids until they sleepily blinked open. She turned around to his side of the bed lazily. He was gone. Her heart sank. The warm day seeming gloomier almost instantly. She wondered how she didn’t notice. Usually, even his slightest movements would wake her up. She missed him already. She moved over to his side of the bed and lay there for a while. It was still warm. The pillow still recovering from the dent his head, heavy with his worries, had left on it. She remembered last night perfectly. It rained violently outside, the roaring thunder sending chills down her spine. She had stood cautiously on the side of his bed, unsure how he would react, looking at him longingly, until he sighed, lifted the sheets and nodded for her get under them. She grabbed the opportunity. Sinking into the fluffy, white bed linen before he could change his mind. He wrapped his arms around her, pulling her closer. Her face against his chest as it moved rhythmically with his breath, she felt protected. They fell asleep in minutes oblivious to the cold, merciless rain outside the tinted window. She lived for nights like these. She walked around the house dully that morning, absent mindedly retracing his steps. There were traces of him everywhere. The tshirt thrown carelessly on the bed. The iron box still warm from the time he hurriedly ironed his shirt for work. The bathroom floor wet and the mirror misty. The smell of his cologne still fresh in the air. Everything seemed to remind her of him. She sulked her way to the drawing room. His coffee mug on the floor and the morning newspaper turned to the sport section spread out on the sofa like it always is. She stopped at the coffee mug curiously, taking a whiff of the coffee that lay warm at the bottom of the mug. The strong, familiar aroma giving her a sudden burst of energy. She made her way to the kitchen. The toaster was still warm, the fridge door left slightly ajar, the unwashed plate in the sink, the half full glass of orange juice on the counter. She looked around gloomily, the loneliness almost tangible. And then she saw it. He had made her breakfast. Her heart leapt. She was ravenous. She attacked the food, devouring it with a vengeance. It distracted her for a few minutes. When she was done, she wandered around the kitchen to look for more. Just then, she heard a familiar noise. Her heart skipped a beat! She ran to the window. She was right. It was him. She waited at the window eagerly, watching as he parked the car and made his way into the building. She raced to the door as the key entered the hole. He walked in, looking worried, the distant frown on his face concerning her. She followed him into the room, watching, as he rummaged through his desk, ruffled the bedsheets and searched his wardrobe. Where’s my wallet, he mumbled to himself under his breath, as shelves and drawers were nosily opened and shut. She ran to the drawing room. She knew she had seen it somewhere. She looked around, breathing a sigh of relief when she saw it lying beside the coffee mug. She picked it up and walked over to his room, leaving it on his bed gently. THANK YOU! He beamed when he saw her, running up to take her in his arms. He planted a big kiss on her face. The kind that made her heart flutter. What would I do without you, he said as he made his way to the door again. She walked over to the window, wagging her tail wildly as she watched him get into the car and merge into the bustling morning traffic. The way you narrated it,you arrested my attention…..beautiful…..can a write up be called cute..I had that feeling for it. kind of falling in love with it instantly..word by word..
Pleasantly surprised by the ending. I loved it! Unexpected twist at the end was the perfect icing on the cake for an already arresting piece. I love your writing! I kinda anticipated that “she” wasn’t a person.. You kept the eagerness alive throughout, wonderfully written.. Kudos to all pets people own.. Such a heartwarming story and captive narration! I’ve read this story 2-3 times in past month and everytime I need a whiff of freshness in my day, I come to your blog.